Sociabble will speak on the importance of social selling for today’s financial services companies, and will present a case study on the deployment of a successful social selling program at BNP Paribas BDDF Entreprises. 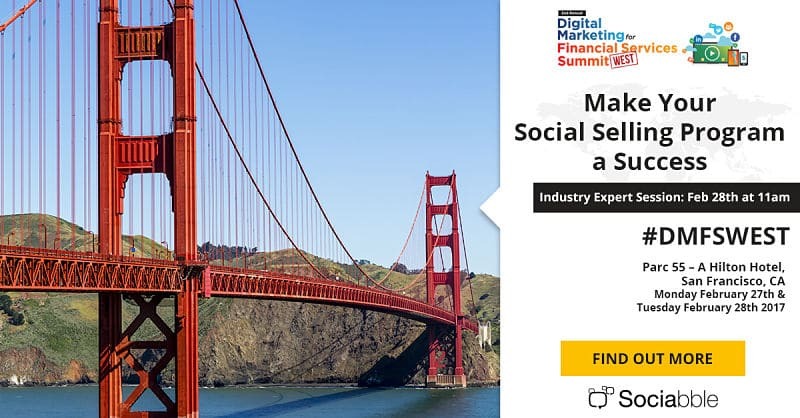 Sociabble is sponsoring and exhibiting at the event, which takes place at the Parc 55a Hilton hotel; not to mention, it is the largest digital marketing conference dedicated to the financial services industry. Summit attendees will have the opportunity to view live product demos of Sociabble, the leading social selling platform, throughout the two-day summit. Social media is transforming the financial services landscape; requiring commercial teams to engage with clients and prospects through personal communication methods that challenge the traditional nature of sales prospection. But helping employees to succeed at social selling doesn’t need to be difficult. During this session, Trina Chaimongkol, Director of Sales and Client Services for the Americas at Sociabble, will present a case study on the deployment of a successful social selling strategy at BNP Paribas BDDF Entreprises. This case highlights the benefits of social selling for financial services companies; as well as how to go about launching a program that is both scale-able and measurable. Sociabble is the leading provider of social selling software. The platform also organizes brand, third-party, and user-generated content onto themed channels; which users can share on social media, and tracks subsequent traffic and lead generation. Available natively for Android, iOS and Windows Phone, Sociabble features also include gamification, newsletters, calls-to-action, advanced analytics, lead tracking, and individual performance dashboards. Additionally, the platform integrates with a number of CRM, curation, listening and retargeting tools, including Office 365, Salesforce and RadiumOne. Used in over 60 countries, Sociabble’s client base includes a large number of financial services companies, such as BNP Paribas and Misys. Contact us to find out more about the Sociabble social selling platform, or to arrange a demo. Interested in social selling? Download our latest whitepaper, Social Selling at Scale.